Concomitant with the rapid loss of tropical mature forests, the relative abundance of secondary forests is increasing steadily and the latter are therefore of growing interest for conservation. We analysed species richness of fruit-feeding nymphalid butterflies in secondary forest fragments of different age and isolation and in mature forest at the eastern margin of the Lore Lindu National Park in Central Sulawesi, Indonesia. From April to August 2001 we collected 2322 individuals of fruit-feeding butterflies, belonging to 33 species. Butterfly species richness increased with succession, but was significantly higher in mature forests than in all types of secondary forest. Isolation of the forest fragments did not have a significant effect on butterfly species richness in the range of distances (up to 1700 m) studied. Rather it appeared to affect only a few species. 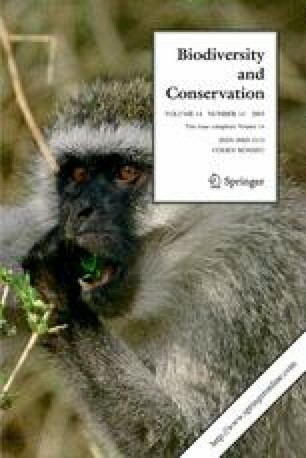 Species richness of endemic species was higher than of non-endemic species. Although endemic species were most diverse in mature forests, many species captured were restricted to secondary forests. Our results show that mature forest is essential for the conservation of nymphalid butterflies and for the endemic species in this area. However, considering the relatively large number of species found in these rather small habitat islands, secondary forest fragments, especially older successional stages, can be taken into account in conservation efforts and thus contribute to the preservation of tropical biodiversity on a landscape scale. Colwell R.K. and Coddington J.A. 1997. EstimateS: Statistical Estimation of Species Richness and Shared Species from Samples. Version 5. User’s Guide and application published at http:// viceroy.eeb.uconn.edu/estimates. Colwell R.K. and Coddington J.A. 2000. EstimateS: Statistical Estimation of Species Richness and Shared Species from Samples. Version 6. User’s Guide and application published at http:// viceroy.eeb.uconn.edu/estimates.